Most professors do not like to think of the university as business and students as customers, and that higher education is nothing like a manufacturing business. Yet, universities produce a service and provide it to people who pay for the service. 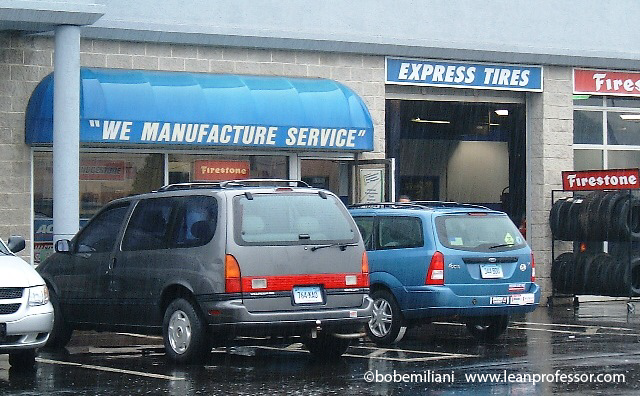 It is not a stretch to say that colleges and universities manufacture educational services (just as the auto repair shop in the photo proudly manufactures service). They do this because there is demand from students and payers (either actual or projected). The process for manufacturing educational services is often poor. So, universities tend to overproduce both courses and degree programs in the hope that some will become popular among students and payers. Overproduction extends to administrative and student support work as well. Over time, universities offer much more than they are capable of delivering with both high quality and low cost. A funny thing nearly always happens in manufacturing businesses (under US-style management): A steady increase in high-paid overhead administrative positions over time results in high costs that lead to layoffs in operations and the outsourcing of work. In higher education, that means teaching faculty and teaching support staff are affected, while administration continues to grow. It is a remarkable progression of events, given that value is created in operations (teaching), while all other parts of the university and processes support that. How does this happen? Think about who is looking at costs and making the decisions about where to cut costs. It is the chief financial officer, the provost, the president, and board. First, they conceptualize a simplified version of the academic job as mostly limited to teaching. Next, they recognize the existence of an oversupply of people who are capable of doing the same or very similar work for less. Third, they have an abundance of administrative workers who can be re-assigned to do work that professors once did: academic advising, curriculum development (basically, a purchasing decision), etc. Full-time teaching will further decline in the near-term in an efforts to help the university survive. Then, 10 or 15 years from now, the errors of this way will be recognized (indeed, obvious), and full-time teaching will return – albeit at reduced levels – just as it has happened with manufacturing. You may think the university is unlike a manufacturer, but its fate is likely to be the same. Why? Because the chief financial officer, whom the provost, the president, and board place their faith and trust, is blind to distinctions such as manufacturing or service (or higher ed). They see only high costs today and recommend quick ways that will reduce costs tomorrow. Their narrow focus assures similar outcomes across all industries. But, this fate is avoidable. Progressive leaders of manufacturing businesses, having seen others go down this losing path, see this as an opportunity to prosper. They recognize the “genba (actual place where value-creating work is done) is what’s important. Only genba generates profit.” But, in order to improve processes on the genba, leaders must think and do things differently than they have in the past – in almost every way. The senior management team bravely adopts Lean management and embarks on efforts to improve every processes in the business, both in operations and administration. Progressive service business leaders do the same. Are there any brave leaders in higher education?